The MEGA-DP MegaVox Deluxe Package from Anchor Audio includes the MEGA-8000U1 MegaVox Pro PA system with Bluetooth and one wireless receiver, MEGA-8001 MegaVox Pro unpowered companion speaker, SS-550 speaker stand, MIC-50 wired microphone with coil cord, CM-60 collar microphone, WB-8000 UHF bodypack transmitter, and a removable shoulder strap for MegaVox PRO. The MEGA-8000U1 speaker is a portable PA system with a powerful and high-efficiency re-entrant horn driver which helps the MegaVox reach a distance of 100 yards. It also features Bluetooth which increases the functionality, flexibility, and utility of your system. This speaker features one 16-channel built-in UHF diversity-wireless receiver that receives signals using two independent antennas. The speaker works on both AC as well as DC power and comes with a built-in rechargeable battery that lasts up to 10 hours on a full charge, making it completely portable. The back panel has a signal alert button to grab everyone's attention, and an external output to power a companion speaker. This PA is lightweight (15 lb) and comes in a durable, UV-treated, fade-resistant case and is suitable for applications where a crowd is to be addressed. The package includes the MEGA-8001 MegaVox Pro unpowered companion speaker. There are no batteries and this speaker must be connected to a powered speaker to run. The back panel has a line-in to be powered by a MegaVox or other Anchor sound system. 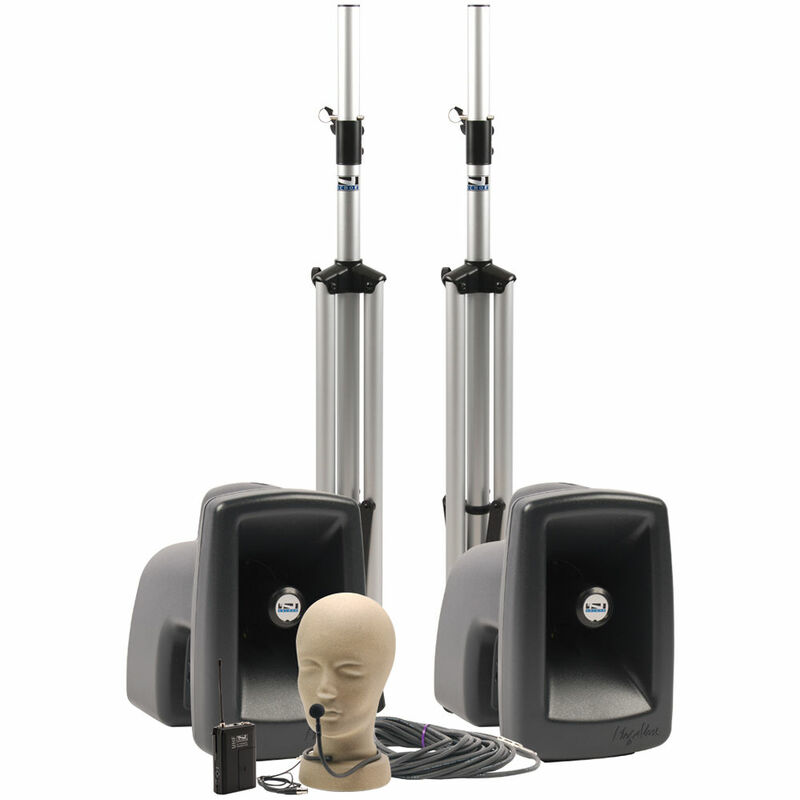 When paired with a MegaVox or any other Anchor sound setup, the system will reach a crowd of 2,000 and more. The package also comes with the MIC-50 wired handheld microphone with 1/4" plug, CM-60 collar microphone with TA4F termination, two SS-550 heavy-duty stands to support the speakers, and a 50' SC-50 connection cable with 1/4" phone plugs. In addition, the package comes with a WB-8000 UHF bodypack transmitter which can be used in various environments such as live sound, TV broadcast, boardrooms, conferences, and public speaking. It features a 16-channel, diversity-UHF transmitter, and can run on two AA batteries for approximately 20 hours. The battery-powered MEGA-8000U1 MegaVox Pro portable public address system from Anchor Audio delivers crystal-clear voice amplification and robust coverage for speaking engagements, sporting events, auctions, military training, emergency preparedness, and more. With 20W of power (AC/DC mode), the high-efficiency re-entrant horn driver produces 119 dB of speech projection that cuts through the venue's ambient sound, and reaches crowds at distances of up to 300'. The MEGA-8000U1 features a built-in Bluetooth receiver and one 16-channel built-in UHF wireless receiver. It is also equipped with two 1/4" microphone inputs and one line input to amplify external devices. For extended sound coverage, the 1/4" speaker output can drive the MEGA-80001 unpowered companion speaker (available separately), and the 1/4" line output allows for daisy-chaining up to six powered MegaVox systems. The rechargeable built-in battery with level indicator allows for the unit to operate six to eight hours on a full charge. The signal-alert button is available to help emergency responders get people's attention. Built with outdoor use in mind, the lightweight (15 lb) MegaVox Pro features a luggage-style handle, and can be mounted on a stand at listening height. It is made in the USA. The MEGA-8001 MegaVox Pro Unpowered Companion Speaker from Anchor Audiois a portable PA system speaker with a powerful and high-efficiency re-entrant horn driver. There are no batteries and it must be connected to a powered speaker to run. The back panel has a line-in to be powered by a MegaVox, or other Anchor sound system. The speaker is lightweight (15 lb) and comes in a durable, UV treated, fade-resistant case. It is capable of reaching a distance of 100 yards and is suitable for schools, playgrounds, sports and cheer, coaches, marching bands, auctioneers, police/fire/military, crowd control, natural disasters, and emergency responders. Band directors can also hook up their metronome to the MegaVox during band practice, and hear it across a large field. The Anchor-Audio SC-50 is a 50 foot long speaker cable to cover the span between your mixing board or amp and your monitor speakers with minimal signal or quality loss. Box Dimensions (LxWxH) 17.3 x 15.5 x 9.4"
Box Dimensions (LxWxH) 17.0 x 15.0 x 9.5"
Box Dimensions (LxWxH) 13.0 x 10.0 x 2.0"